The Naval Battle of Navarino (1827). Oil painting by Garneray. After initial negotiations failed with the Ottoman Sultanate, Britain, France, and Russia prepared to enforce the provisions of the Treaty of London through military action. In the summer of 1827, a large Ottoman-Egyptian fleet was being assembled in Alexandria for operations in the Greek theater, and Allied commanders sent a warning to Mehmet and Mahmud not to send the flotilla. The Ottoman-Egyptian leaders ignored what they believed to be meddling by the Allies into Sultanate affairs. As the fleet left Alexandria for Greece on August 5, 1827, the Ottoman leadership was finally in a position to finish off the remaining partisan rebel fighters and in putting an end to what had become known as the Greek War of Independence. On August 20, 1827, Vice Admiral Sir Edward Codrington, commander of the Allied combined naval task force, received instructions from the Admiralty informing him that he was to impose and enforce the provisions of the London Treaty on both sides and to interdict the flow of reinforcements and supplies from Anatolia and Egypt to Ottoman forces in Greece. The application of military force against the Ottoman-Egyptian fleet, the communication stressed, should be used only as a last resort. On August 29, the Sultanate formally rejected the Treaty of London’s provisions, aimed at granting Greece autonomy while keeping the province within the empire. From September 8 to 12, 1827, the Ottoman-Egyptian fleet from Alexandria joined other Ottoman warships in Navarino Bay (present-day Pylos), located on the west coast of the Peloponnese peninsula in the Ionian Sea. The Ottoman warships within the bay, in addition to imperial ships, were a combined force with warships from Algeria and Tunis as well as the Egyptian naval vessels. Ibrahim, Mehmet’s son and in operational command of Egyptian-Ottoman forces, was contacted by Codrington and agreed to halt fighting until he received further instructions from his father who was involved in communications with the Western allies at his headquarters in Egypt. However, on October 1, the Greek rebels continued operations against Ottoman forces that had been ordered to temporarily stand down, leading Ibrahim to disregard his agreement with Codrington and in resuming attacks against the Greeks. On October 13, Codrington was joined off Navarino Bay by French and Russian warships. While Codrington believed his combined fleet had the necessary firepower to destroy the Ottoman ships arrayed in Navarino Bay, his instructions were to impose the provisions of the treaty peaceably if possible. Therefore, he sailed his fleet into Navarino Bay in single column with the British in the lead, followed by the French, and then the Russians. Eleven Allied ships-of-the-line (average 70 guns each) and 9 frigates and 4 smaller warships, bringing to bear nearly 1,300 guns, all sailed boldly into the bay where 70 warships of the Ottoman Empire lay at anchor with more than 2,000 cannon at the ready. Adding to the Turkish firepower were the shore batteries, which were under Ottoman control. The Ottoman fleet had taken a horseshoe or arc formation with three lines, and the ships-of-the-line anchored in the first wave. The Allied forces had superior firepower in that their cannon aboard the ships-of-the-line were 32-pound guns, as most of the cannon available to the Turks were 24-pounders. Additionally, while the Allies possessed 11 ships-of-the-line, the Ottomans had only 3 and, while the Turks had more than 70 ships, 58 were smaller vessels such as corvettes and brigs. Further still, the Allied crews, particularly the British and the French, had extensive combat experience during the Napoleonic Wars, while most of the Ottoman crews’ only experience was in fighting smaller vessels. As if the superior firepower and superior gunnery expertise were not enough to tilt the odds in the Allies’ favor, the Ottomans’ ability to fight the Battle of Navarino was severely constrained by an additional and unforeseen development. The Egyptian fleet present at Navarino Bay had largely been constructed or purchased with supervision by European naval officers, mostly French. The fleet had also been trained by a team of French officers under the overall direction of Captain J. M. Letellier,and these men served aboard the Egyptian-Ottoman warships as “shadow officers.” On October 19, the day before the Battle of Navarino, French Rear Admiral De Rigny, serving with the combined Allied fleet, convinced the French officers to withdraw from the Egyptian fleet. They removed themselves to a smaller vessel in the bay and attempted to provide logistical advice to the Egyptians, but the damage to morale and effectiveness was significant. 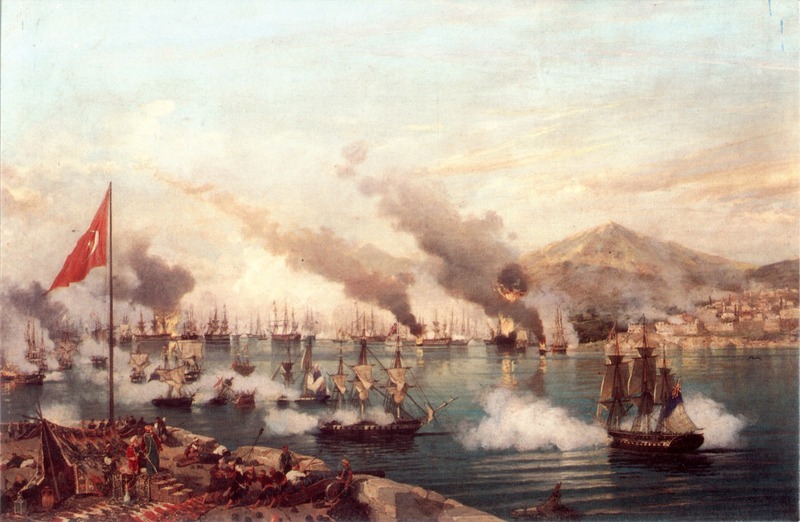 Most of the Ottoman sailors had been pressed into service (essentially forced conscription), and, as the French shadow officers withdrew from their crews, one can imagine the sadness some of the officers must have felt for these unfortunate and unwitting souls as powerful naval artillery prepared to open fire at them from point-blank range as well as the anxiety and fear that must have permeated the young Egyptian and Ottoman sailors. I gave orders that no guns should be fired unless guns were first fired by the Turks; and those orders were strictly observed. The three English ships were accordingly permitted to pass the batteries and to moor, as they did with great rapidity, without any act of open hostility, although there was evident preparation for it in all the Turkish ships; but upon the Dartmouth sending a boat to one of the fire vessels, Lieutenant G.W.H. Fitzroy and several of her crew were shot with musketry. This produced a defensive fire of musketry from the Dartmouth and La Syrene, bearing the flag of Rear-Admiral de Rigny; that succeeded by cannon- shot at the Rear-Admiral from one of the Egyptian ships, which, of course, brought on a return, and thus very shortly thereafter the battle became general. Following two hours of battle, all Ottoman ships-of-the-line and most of the large Ottoman and Ottoman-allied frigates had been destroyed; after two more hours of fighting, the remaining Ottoman naval vessels had been sunk, scuttled, or set on fire. While no British, French, or Russian ships had been sunk, several ships had suffered significant damage; one Allied ship-of-the-line had 180 hull breaches (pierced by enemy cannon balls), while three Russian ships-of-the-line were essentially disabled, and three British ships, including Codrington’s flagship, HMS Asia, were required to sail for England to immediately undergo repairs. The Allied fleet suffered 181 killed and 487 wounded, while the Ottoman fleet incurred losses exceeding 4,000 killed or wounded. Word of the outcome of the battle reverberated throughout the maritime-oriented community that was Greece. People, in village after village upon hearing the news, rushed to the village squares, as church bells rang out and huge bonfires were lit on the mountain tops of the Peloponnese and Mount Parnassus in Central Greece. Demoralized Ottoman garrisons in the occupied zones made little effort to curtail the celebrations. The Battle of Navarino marked that final naval engagement between sailing ships with unarmored hulls and brandishing muzzle-loading, smooth-bore cannon. It also marked the first use in naval history of a steam-powered warship, as the relatively small Greek ship, the Karteria of the fledgling revolutionary navy, propelled by steam-powered paddles (as well as sails) made its appearance during the battle. After suffering the devastating loss of essentially his entire navy and forced to withdraw his now unsupportable infantry from Greece, Mehmet demanded extra compensation for his losses from the Sultan. Mehmet demanded of the Sultan the Ottoman Eyalet of Syria in exchange for the loss of his navy. In Arabic, the region surrounding Syria is referred to as Bilad al-Sham (the Levant), and for centuries those in Mesopotamia, Persia, Anatolia, and Egypt sought to control it, as it possessed abundant resources as well as featuring the world’s most ancient yet developed international trading communities centered on Damascus, Aleppo, and the Mediterranean coastal cities. Moreover, from Mehmet’s perspective, possession of Syria would also provide a buffer zone against Ottoman power as well as a buffer zone against any foreign power that eventually seized control of Constantinople and Anatolia. With Egyptian military capacity based in Syria, it would also provide Mehmet with a possible staging area for direct operations against the Ottomans, should at some future time Mehmet decide to march on Constantinople. For those same reasons, the Sultan refused Mehmet’s demands. In response, Mehmet built a new navy, and on October 31, 1831, under Mehmet’s son, Ibrahim, Egypt invaded Syria in the opening phases of the First Turko-Egyptian War. Ibrahim’s forces quickly overran Syria except for the well-fortified port city of Acre, which required a six-month siege, before capitulating on May 27, 1832. However, the costs of the expedition required Mehmet to demand increases in fees and taxes from the Egyptian population, which created significant levels of domestic discontent with Mehmet’s leadership. In addition to the domestic front, Mehmet soon realized the discomfort of the major European powers with his actions against Constantinople. The slow dissolution of the empire was unfolding as the Europeans and Russians moved to control or liberate key pieces of empire property. However, both the Europeans and the Russians did not wish to see Mehmet enthroned as the new Ottoman Sultan with control in Egypt, the Levant, Anatolia, and the key port cities that dotted the Eastern Mediterranean coastline between Asia Minor (Turkey) and North Africa. After the fall of the stubborn port city Acre, Ibrahim took the Egyptian army into Anatolia and defeated an Ottoman army led by Reshid Pasha at the Battle of Konya on December 21, 1832. Sultan Mahmud II realized that, should Mehmet wish it, the Egyptian army could now march largely uncontested on Constantinople. Moscow, sensing opportunity, offered Mahmud military assistance and concluded the Treaty of Hunkar Iskelesi (Unkiar Skelessi) with him on July 8, 1833, to formalize the Sultan’s acceptance. With the Russians seeking to continue their push south and in creating a greater Mediterranean presence by taking advantage of Ottoman weakness, the Treaty of Hunkar Iskelesi brought a sharp reaction from Britain and France. The treaty included a secret clause that opened the Dardanelles to Russia in time of war, while precluding its use by anyone else. Both nations negotiated the Convention of Kutahya between Mehmet and Mahmud II in May 1833, which stipulated that Mehmet would withdraw his forces from Anatolia and in return would receive Crete and the Hejaz (in Arabia) in compensation. Moreover, Ibrahim would be appointed Wali or governor of Syria in return for a yearly tribute payment to the Sultan. Inhabitants of the Syrian Eyalet chaffed at their new Wali, uncomfortable with Egyptian policies at what they perceived to be excessive taxation, forced labor, a general disarmament of the population, and military conscription. A variety of incidents and uprisings began in 1834. On May 25, 1838, Mehmet informed the British and the French that he intended to declare independence from the Ottoman Empire and Mahmud II ordered his forces to advance into Syria. Ibrahim defeated them at the Battle of Nezib on June 24, 1839, and afterward, the Ottoman fleet defected to Mehmet. Mahmud II died almost immediately following the loss at Nezib and the defection of the Ottoman navy. On July 15, 1840, Britain, Austria, Prussia, and Russia signed the Convention of London, which offered Mehmet hereditary rule in Egypt provided the North African country stayed in the Ottoman Empire and provided he withdrew from Syria and the coastal regions of Mt. Lebanon. Mehmet mistakenly believed that the French were prepared to side with Egypt and was consequently dismissive of British demands. Following this, British and Austrian naval forces blockaded the Nile Delta and shelled Beirut on September 11, 1840. On November 27, 1840, Mehmet agreed to the terms of the Convention of London and renounced claims over Crete, Syria, and the Hejaz. Also instituted in the 1841 agreement, to which France also reluctantly acquiesced, was the Anglo-Ottoman Commercial Convention of 1838, which abolished Mehmet’s monopolistic control over Egyptian domestic and foreign commerce. Further diminishing Mehmet’s power was a requirement in the agreement that compelled the reduction of the Egyptian army from more than 100,000 troops to no more than 18,000. From 1820–1840, Ali enjoyed the continuous support of France. Following his defeats of 1840–41, Ali and his successors never recovered from the effects of the European intervention, although his grandson, Ismail (1863–79) came closest to emulating the dynasty founder. Ismail’s heavy borrowing at ruinous discounts and interest rates for his ambitious schemes of military, economic, and social modernization hastened his downfall. By the time of his dismissal in 1879, Britain and France were exercising a dual control over Egypt’s finances under the authority of a public debt commission. After mounting crises beginning with the Urabi coup d’etat in September 1881, Britain backed into the occupation of Egypt the following July, without precipitating war in Europe. For more than sixty years thereafter, Whitehall decided the fate of the Egyptian army. From 1606 to 1826 the Ottoman Empire instituted efforts aimed at reforming its gunpowder weapons-brandishing medieval armed forces. In Persia, the problem was even more acute than that faced by Constantinople. The Shah during the time of the Qajar dynasty and continuing into the nineteenth century was forced to rely on militias that constantly required extensive negotiations as well as expensive promises all contributing to an extended mobilization process. For the Ottomans, Sultan Selim III attempted to reorganize the army (Nizam-i Cedid) in the late eighteenth century but met considerable resistance from a number of entrenched interests, most notably from the infantry units known collectively as the Janissaries. As a result of his attempts at modernization and reform, the Sultan was driven from power in 1807. His successor, Mahmud II, in November 1808, only months after becoming Sultan was faced with a revolt by the Janissaries rebelling yet again at plans toward modernizing the army. The Janissaries killed Mahmud’s “grand vizier” Mustafa Bayraktar Pasha who had been ordered to spearhead the reform efforts and to modernize the Ottoman army. These events, coupled with the difficulties experienced by a long line of predecessors, led Mahmud II to proceed with caution in his reform efforts. Eventually, however, on June 15, 1826, during the Vaka-i Haryire or “good incident,” troops loyal to Mahmud II shelled the Janissary barracks in Constantinople, killing several thousand inside. The Janissary corps was subsequently dissolved and its provincial garrisons disbanded. The event is recorded and celebrated in Turkish history as the “auspicious event,” which overcame a key obstacle and provided the opportunity to create that which eventually became modern Turkey. This entry was posted in Ottoman by MSW. Bookmark the permalink.